Tottenham midfielder Dele Alli has scored a header to equalise for Spurs against Fulham. Mauricio Pochettino’s side went behind early on after a disastrous own goal. 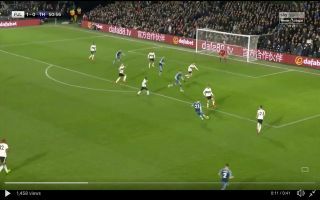 In the 51st minute of the match, Fulham defender Tim Ream echoed Fernando Llorente by making a costly mistake, the American completely missed the ball when attempting a clearance, leaving Christian Eriksen to pick out Alli. The chemistry between Eriksen and Alli is amazing, the England international signalled for a cross into the box and Eriksen delivered an inch-perfect ball after a quick look up into the box. Alli lost his marker and headed the ball into the back of the net. Spurs are currently third in the league, the battle for the Premier League title is a two-horse race but Tottenham could win some silverware this season, they are one match away from winning a spot in the Carabao Cup final.